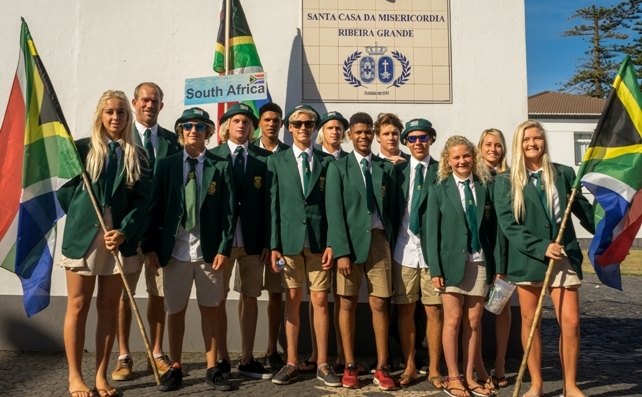 The 2016 South African junior surfing team finished ninth out of the 39 nations who participated in the VISSLA ISA World Junior Surfing Championships that ended with France claiming their first ever team gold medal in the Azores archipelago off the coast of Portugal yesterday (Sunday). France overtook Australia in the overall team rankings on the penultimate day of competition and maintained their grip on the lead on final day. Australia finished with the silver medal, Hawaii with the bronze and Japan took their first ever team medal with the copper in a promising preview of their drive to develop the sport on the road to Olympic Surfing in Tokyo 2020. USA’s Caroline Marks (Girls U16), France’s Thomas Debierre (Boys U16), Hawaii’s Brisa Hennessy (Girls U18) and Brazil’s Weslley Dantas (Boys U18) were crowned the individual gold medallists and became the first individual World Junior Champions in the era of Olympic Surfing. The manager was Karen Elkington (Kommetjie) and Chris Bond (Cape Town) was the coach. 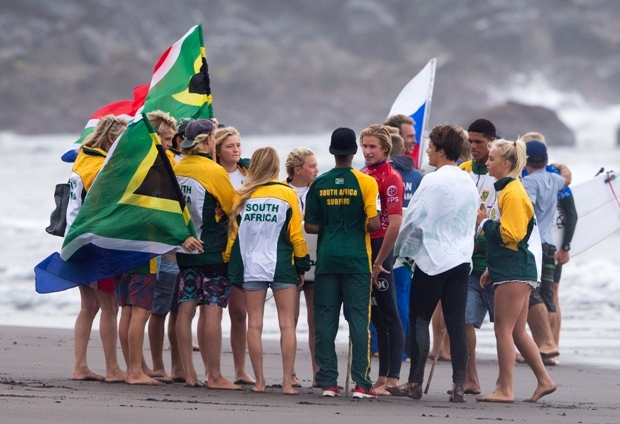 The South African junior surfing team climbed four places to No.7 among the 38 nations in the provisional team rankings after an action packed Day 6 of the VISSLA ISA World Junior Surfing Championships in the Azores Archipelago off the coast of Portugal on Thursday. Tricky overhead waves and variable winds at Praia Monte Verde, along with the introduction of single elimination heats from Round 3 in all divisions, saw four South African team members eliminated from the event and four progressing to the next round with great performances in their respective divisions. The team still has six members in contention for individual medals and trails Australia with 11, France (10), Hawaii (9), Japan (8) and the USA and Brazil with seven each. Adin Masencamp (Strand) was South Africa’s top performer on the day, squeaking through his U18 Boys Round 3 heat in second place before delivering one of the rides of the event to win his Round 4 match-up and move into the last 16 of the division. The 17 year-old from Strand in the Western Cape was rewarded with a 9.07, one of only six rides over 9.0 points in the event to date, for two massive backhand re-entries on a hollow overhead wave. He then added a 5.17 to his tally on his next ride which left his three opponents in a combination situation where they needed more than a perfect 10 point ride to overtake him. Masencamp is the only South African left in the U18 Boys division of the four who started the day. Joshe Faulkner (Jeffreys Bay) and Jordy Maree (Kommetjie) both finished third in their Round 3 clashes, leaving the event in equal 33rd place and contributing 320 points to the team total. Bevan Willis (Salt Rock) won his Round 3 heat with a strong performance and then narrowly missed out on second place, and berth in the last 16, in Round 4. Willis’ equal 17th place result in the division earned 400 points for the team. On Podium 2, Max Elkington (Kommetjie), Sebastian Williams (Durban) and Koby Oberholzer (Warner Beach) all won their U16 Boys Round 3 encounters, with Angelo Faulkner (Jeffreys Bay) the only casualty when, despite riding six waves, he finished fourth in a low-scoring affair. Surfline, the official forecaster, is calling for continued Northwest swell for Friday, with more size in the morning and slowly fading through the day. The remnants of this powerful swell will provide plenty of surf for the rest of the contest period through finals day on Sunday, September 25. South Africa will have five team members in action on the two podiums today (see Schedule below). A five person South African squad, four males and one female) will also contest the semifinals of the Aloha Cup tag-team event this afternoon. The Aloha Cup is a form of relay surfing and features the top eight ranked teams from last year’s ISA World Junior Champs in California, where South Africa finished seventh overall. The action at the VISSLA ISA World Junior Surfing Championship can be watched LIVE at www.surfingsouthafrica.co.za starting at approximately 10am SA time daily. The latest news, results, photographs and video footage are also available on the website. 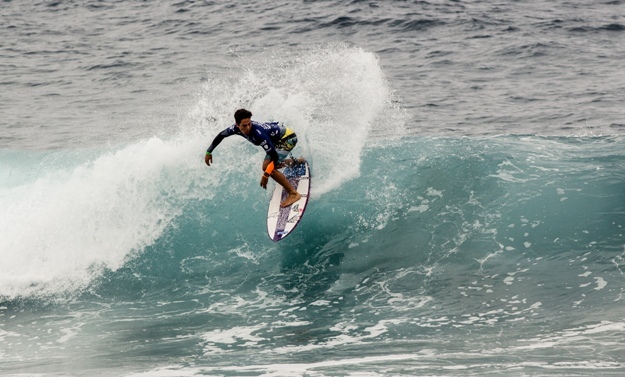 The 2016 VISSLA ISA World Junior Surfing Championships got underway on San Miguel Island in the Azores on Saturday, bringing together a record-breaking 371 surfers from 39 nations in the largest gathering of junior surfers since becoming a stand-alone event in Durban in 2002. . The first ISA event for surfers aged 18 and under since last month’s IOC decision to include surfing in the 2020 Olympic Games in Tokyo started with the teams marching through the streets of Ribeira Grande in their colourful regalia in the traditional Parade of Nations. Then came the stirring Sands of the World Ceremony where sand from each team’s beaches was poured into a container to symbolize the peaceful gathering nations of the world through surfing..
Competition began at 3pm with the first 12 heats of the Under-18 Boys and U16 Boys divisions running simultaneously on separate podiums on the North facing beach of Praia de Monte Verde in bright sunshine, warm water and small 0.6 to 1.0 metre waves. The three South African boys in action displayed the team’s intent immediately by finishing in the top two in their respective heats to advance directly to Main Event Round 2 and avoiding the cutthroat Repercharge rounds. Joshe Faulkner (Jeffreys Bay) won his opening U18 Boys heat, outpointing opponents from Tahiti, Israel and Norway, followed by Adin Masencamp (Strand) who finished second to Ariel Sanin (ISR) in a nail biting, low-scoring encounter where the top three were separated by just 0.54 of a point. In the U16 Boys, Max Elkington (Kommetjie) earned a pair of six point rides to secure a narrow heat win over Cristian Portelli (SWE) as the pair dispatched rivals from Brazil and Germany to the Repercharge round. The VISSLA ISA World Junior Surfing Championships features national teams made up of four U18 and four U16 boys along with two U18 and two U16 girls. They compete for individual honours with the top four finishers in each division being awarded gold, silver, bronze and copper medals at the closing ceremony next Sunday (25 September). The national team accumulating the highest points tally from the final results of all its members is awarded the ISA World Junior Team Champion Trophy and holds bragging rights as the world’s top junior surfing nation until the next edition of the event. Due to the record number of competitors, the event will only feature two Repecharge Rounds, moving into a single elimination format from Round 3. The 2016 South African junior team got their campaign off to a good start by winning a warm-up event at Praia de Monte Verde on Friday, convincingly defeating teams from New Zealand and Great Britain in a tag-team format. The final result was SA 79 points, NZ 49 and GB 47. The action at the VISSLA ISA World Junior Surfing Championship can be watched live at http://isaworlds.com starting at approximately 11am SA time daily. The latest news, results, photographs and video footage are also available on the website. The 2016 South African surfing team finished 11th out of the 26 nations that participated in the INS ISA World Surfing Games that ended with Peru claiming the team gold medal and the coveted Fernando Aguerre World Team Trophy in front of a huge crowd at Jaco Beach in Costa Rica yesterday (Sunday). Leandro Usuna from Argentina, competing in his third successive Men’s final, collected a second gold medal after his victory in Peru in 2014 by comfortably outpointing Lucca Mesinas (PER), defending men’s titlist Noe Mar McGonagle (CRI) and Francisco Bellorin (VEN) in an all Latin American final match-up. Tia Blanco (USA) successfully defended the title she clinched in Nicaragua last year, finishing just 0.05 of a point ahead of runner-up Dominic Barona (VEN), with event standout Pauline Ado a further 0.21 back and her French teammate Justine Dupont claiming the Women’s copper medal. “Congratulations to the Team Gold Medallist, Team Peru, and the individual Gold Medallists Tia Blanco and Leandro Usuna,” said ISA President Fernando Aguerre. “This event has been the first one after the IOC inclusion of Surfing into the Tokyo 2020 Olympic Games. Now all surfers in the world have the chance of becoming Olympians, the first ever Olympic surfers”. The 2016 South African surfing team was made up of team captain Faye Zoetmulder (Cape St Francis), Tanika Hoffman (Hout Bay), Matt McGillivray (Jeffreys Bay), Shane Sykes (Salt Rock), Dylan Lightfoot (Jeffreys Bay) and Jordy Maree (Kalk Bay). Newly elected Surfing South Africa President Johnny Bakker (Port Elizabeth) was the team manager. The South African surfing team completed a clean sweep of results on Day 2 of the INS ISA World Surfing Games at Jaco Beach in Costa Rica when all four team members in action on Monday finished in the top two in their respective heats and advanced to the next round of the Main Event. Organisers again completed 24 heats, 12 heats of Men’s Main Event Round 2 and 12 of Women’s Main Event Round 1, in slightly smaller waves, extreme tidal variations and conditions that varied from clean and sunny to gusty showers. Shane Sykes (Salt Rock) again led the South African surge, finishing second to Portugal’s Eduardo Fernandes but ahead of competitors from Puerto Rico and Canada in the first heat of the day to progress to the last 24 in Main Event Round 3. Competing in the last heat of the round, Matt McGillivray (Jeffreys Bay) utilised his aerial prowess to grab victory ahead of runner-up Jordy Lawler (AUS) as the pair relegated their opponents from Puerto Rico and Nicaragua to the Repecharge rounds and join Sykes in Round 3. Team captain Faye Zoetmulder (Cape St Francis) fought a gritty battle in the opening heat of the Women’s event, eventually taking second place and a berth in the next round of the Main Event. Zoetmulder ended the heat behind runaway heat winner Lucia Indurain (ARG) and just 0.13 of a point ahead of Christina Vargas (ECU). Tanika Hoffman (Hout Bay) completed South Africa’s Day 2 success story by posting a solid runner-up finish in her opening heat, challenging Ecuadorian star Dominic Barona for the lead and well clear of third placed Josefina Ane (ARG). Although only two of eight days of competition have been completed, South Africa’s strong Day 2 performance will have raised their confidence in the chase for a team medal. Each of the 26 national teams in Costa Rica already have at least one team member in the grueling Repecharge rounds. Much will depend on the performances of Jordy Maree (Kalk Bay) and Dylan Lightfoot (Jeffreys Bay) as they start their long and arduous campaign through the Repecharge rounds after failing to make the cut in their opening heats on Day 1. The talented pair face what appears on paper to be relatively easy Repecharge heats in Round 1 against rivals from Russia, Switzerland, Guatamala, Nicaragua and Peru today. But with the vagaries of waves, tides and wind to contend with, and the fact that they face elimination from the event if they do not finish in the top two in every heat from here on, they will have to be supremely focused throughout every match-up. Four South Africans will again be in action today at Jaco Beach with Sykes and McGillivray having earned a day off. Surfline, the official forecaster, is predicting that one metre South West swell will continue with some reinforcements on Tuesday, August 8. On Wednesday, August 9, a new South West swell will begin to creep in and fill in fully on Thursday, August 10, providing some testing bigger waves. The South African challenge for honours at the INS ISA World Surfing Games in Costa Rica got off to a mixed start yesterday when two members of the team advanced directly to the next round of the Main Event and the other two were relegated to the grueling Repecharge rounds. Organisers completed all 24 heats of Men’s Round 1 in rippable one metre waves at Jaco Beach with South Africa getting off to a good start when Shane Sykes (Salt Rock) posted one of the top 10 heat totals of the day’s action – 13.34 out of 20 – to win his opening encounter. Including an excellent 8.27 (the day’s seventh highest score for a single ride) in his tally, Sykes finished just ahead of Francisco Bellorin (VEN) as the pair banished third and fourth placed Jeames Young from perennial contenders Australia and WSG veteran Matt-Lewis Hewitt (NZL) to the Repecharge stream. Jordy Maree (Kalk Bay) was next up but, despite looking in good form, the replacement in the team for an injured Michael February was unable to find the waves that offered high scoring potential and finished fourth in a heat won by 2014 ISA champion Leandro Usuna (ARG). Dylan Lightfoot (Jeffreys Bay) joined Maree in the Repecharge stream when he was narrowly pipped for second place in a closely contested, high scoring heat where all four competitors were separated by less than two points. Fellow Jeffreys Bay resident Matt McGillivray ensured that the team finished the day in good spirits. Using his trademark aerial skills, McGillivray completed a high flying air-reverse that earned an excellent 8.60 from the judges, the third highest score of the day, to grab second place and advance to Round 2 of the Main event. While competitors in the Repecharge stream can still make their way to the final of their division, they need to compete in almost twice as many heats as those in the Main event stream and cannot afford to finish outside of the top two in any subsequent heat. Costa Rica, the defending team champions and event hosts, along with USA and the powerful French team saw all four of their men advance directly into Round 2 of the Main event on Day 1. All of the other 23 teams in the event have at least one team member facing the cutthroat Repecharge rounds. Today’s schedule in Costa Rica starts with 12 heats in Men’s Main event Round 2 followed by 12 heats of Women’s Main event Round 1. Sykes is in the first heat of the day at 4pm South African time with McGillivray in Heat 12 at approximately 7.45pm. Team captain Faye Zoetmulder (Cape St Francis) is in the first heat of the Women’s division (directly after McGillivray’s heat) and Tanika Hoffman (Hout Bay) is Heat 8, about 2.5 hours later. Surfline, the event’s official forecaster, predicts the South West swell mix will continue on Day 2 of competition, providing plenty of contestable surf. Looking ahead in the contest period, a new swell is set to fill in on Wednesday, August 9, and show more size on Thursday, August 10. The four men in the 2016 South African Surfing Team will take to the waves at Playa Jaco in Costa Rica today after the INS ISA World Surfing Games were officially opened at a stirring ceremony in Jaco in the north of Costa Rica yesterday (Saturday). Local spectators thronged the streets as the 142 competitors and their officials from 26 nations marched to the beachfront in the ‘Parade of Nations’. South African team captain Faye Zoetmulder and Dylan Lightfoot then joined two delegates from each of the other nations in the symbolic ‘Sands of World’ ceremony where sand from each country’s beaches was deposited into the special glass receptacle. After a rousing rendition of the Costa Rican national anthem followed by traditional local dancers, ISA Vice President Casper Steinfath officially declared 52nd ISA World Surfing Games open. “A special thank you to the beautiful country of Costa Rica and all its welcoming people for giving us all such a warm welcome. Costa Rica truly is a surfing nation of the World and we are grateful that they will be sharing their amazing waves with us all this week,” said Steinfath, representing ISA President Fernando Aguerre, who is currently in Rio de Janeiro attending the 2016 Olympic Games following the International Olympic Committee’s decision earlier in the week to include Surfing in the 2020 Tokyo Olympic Games. Surfing competition gets underway at Jaco Beach at 8am (4pm South African time) on Sunday. The opening day’s schedule will feature the 24 heats in Men’s Round 1 with South Africa’s four men scheduled to compete in Heat Nos. 3, 7, 19 and 23. South Africa, who are unseeded as no team was sent to the 2015 event, face tough opposition from the outset of the eight day event which ends with the finals next Sunday. Shane Sykes (Salt Rock) will be the first South African to compete in the event when he takes on opponents from Australia, New Zealand and Venezuela in Heat 3. Sykes will be followed by Jordan Maree (Kalk Bay) in H7, Dylan Lightfoot (Jeffreys Bay) in H19 and Matthew McGillivray (Jeffreys Bay) in H23. 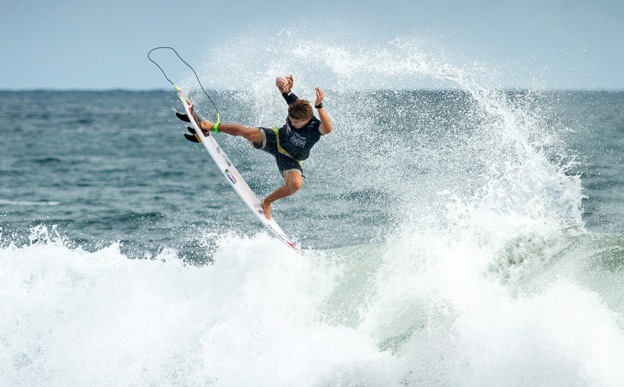 In the double elimination format used at ISA events, the top two surfers in each of the three or four person heats advance to the next round of the Main Event. Those finishing third or fourth drop into the grueling Repercharge Rounds where they are given another chance to reach the final of their division, provided they do not finish outside the top two in any subsequent heat. Gold, silver, bronze and copper medals will be awarded to the top four in the Men’s and Women’s divisions, as well as the top four national teams at the event, after the finals are concluded on Sunday 14 August. South Africa won the team title in 1978, 2001 and 2013. The South African women, Faye Zoetmulder (Cape St Francis), who was unanimously elected the team captain on Friday, and Tanika Hoffman (Hout Bay) will be in action when the Women’s event gets underway tomorrow. Fun-sized, contestable waves are expected for the competition, as Surfline, the official forecaster of the 2016 INS ISA World Surfing Games, has predicted a run of fading Southwest swell for the beginning of the contest period, to be followed by a reinforcing swell for the second half of the holding period. 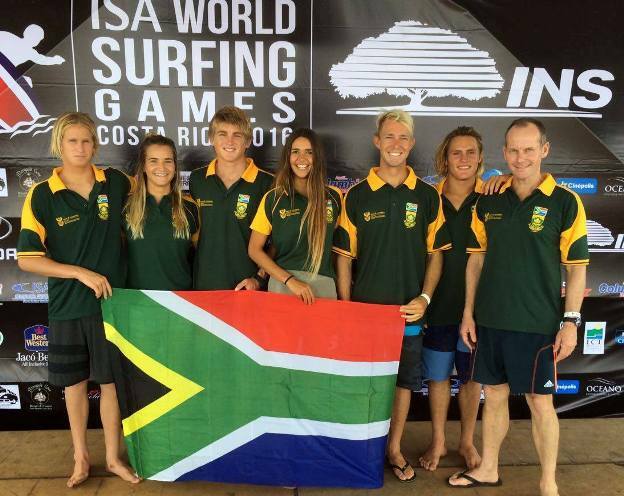 The South African Junior Surfing team placed seventh out of the 36 national teams at the 2015 VISSLA ISA World Junior Surfing Championship which ended on Sunday in Oceanside, California. The hosts, USA, won the coveted ISA World Junior Team Trophy for the first time since the ISA junior worlds were inaugurated as a stand-alone event in Durban in 2002. The winners accumulated 7 536 points from the results of their 12 person team, well ahead of runners-up France with 6 565. Defending team champions Hawaii clinched the bronze medal this year followed by Australia, Japan, Portugal, South Africa and Costa Rica. The top eight teams in the final standings qualify for the Aloha Cup tag-team event at the next edition of the event in the Azores in September 2016. Italy’s Leonardo Fioravanti won the Boys’ U18 division, earning a perfect 10 point ride in the final and then adding a near-perfect 9.23 for the highest heat total of the entire event – 19.23 out of 20. France’s Tessa Thyssen took the gold medal in the Girls’ U18’s, USA’s Stevie Pittman prevailed in the Boys’ U16 final and Hawaii’s Summer Macedo clinched the Girls’ U16 title. Team captain Shane Sykes (Salt Rock) was SA’s top performer, advancing to the Main Event semi-finals before dropping in the Repercharge Rounds where he was eventually eliminated in ninth place overall in the division. Sebastian Williams (Jeffreys Bay) finished 13th in the U16 boys, Teal Hogg (Umhlanga) ended 25th on the U18 girls and Olivia Izzard (La Lucia) also claimed 25th place in the U16 girls. The Aloha Cup squad made up of Richard Kidd (Ballito), Joshe Faulkner (Jeffreys Bay), Chanelle Botha (Warner Beach), Ntando Msibi (Durban) and Michael Monk (East London) placed fourth in their semi-final and equal seventh overall in the tag-team event. 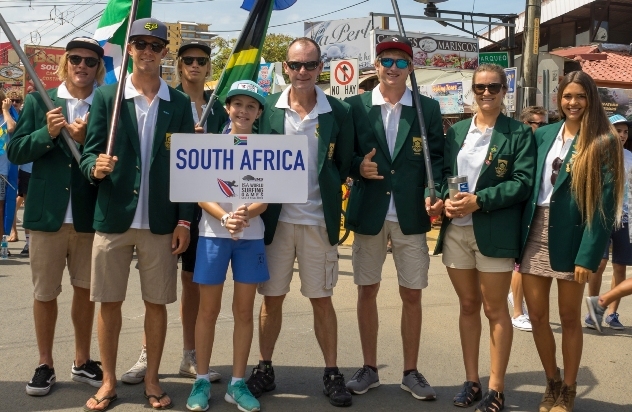 The SA team were a presence on the beach throughout the eight day event, vociferously supporting their team mates by blowing vuvuzelas, waving flags, whistling and cheering. The team was well managed by Isaac February Kommetjie) and coached by Greg Emslie (East London) and David Malherbe (Coffee Bay). Surfing South Africa is the recognised governing body for the sport and is a member of the South African Sports Confederation and Olympic Committee (SASCOC) and the International Surfing Association (ISA). All South African surfing teams that participate in international events are ratified by the Board of Directors of Surfing South Africa. Tricky conditions with inconsistent waves and onshore winds resulted in four members of the South African team being eliminated on Day 4 from the VISSLA ISA World Junior Surfing Championship at Oceanside in California yesterday. Shane Sykes continued to lead the team by example and is the only South African left in the Main Event stream. The captain placed second in his U18 boys’ Round 3 heat to advance to the last 16 in the division and is now halfway to reaching the Grand Final. Joshe Faulkner, Teal Hogg and Olivia Izzard all clinched runner-up berths in their Repercharge Round 2 encounters in the U16 boys’ and the U18 and U16 girls’ divisions respectively. The trio stay on track for the business end of the event while steadily accumulating additional points for South Africa in the team standings. 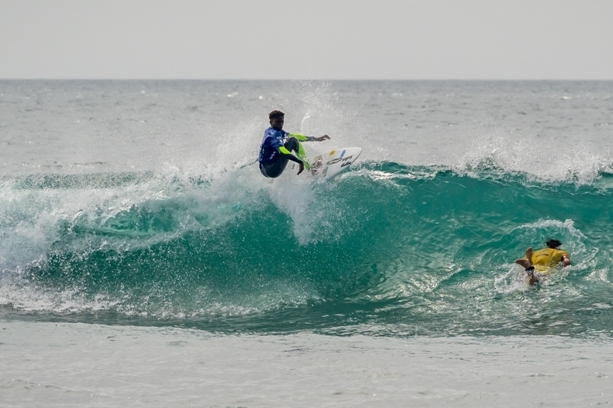 Ntando Msibi dropped into U18 boys’ Repercharge Round 4 after ending fourth in his Main Event Round 3 heat yesterday, as did Sebastian Williams, Luke Malherbe and Adin Masencamp who finished outside the top two in their U16 boys’ Main Event Round 3 heats. All will resume their campaigns in the repercharge rounds where competitors are given a second chance in cutthroat 15 minute heats. The other four South Africans team members dropped out of the event after losses in their respective repercharge heats. U18 boys Richard Kidd and Michael Monk placed equal 49th overall and contributed 240 points each towards SA’s team total while Chanelle Botha (U18 girls) and Sophie Bell (U16 girls) placed equal 33rd in their divisions and added 320 points each to the team tally. South Africa has dropped to 10th place in the provisional team standings. Hawaii, France and the USA still have all 12 team members in contention while Japan, Australia and Portugal have had one surfer eliminated, Costa Rica and Tahiti have ‘lost’ two and Peru three. All eight South African still in the event will be competing today. See the schedule for Day 5 below with the South African team members and their heat numbers in brackets. Surfline, the official forecaster predicts 3-4’+ (1.0 to 1.3 metre) wave faces on Friday, with occasional larger sets on the best tides. The conditions will be clean in the morning with light offshore wind, trending light onshore in the afternoon. The VISSLA ISA World Junior Surfing Championship runs until Sunday 18 October and the action from both sides of the pier can be followed live at http://isaworlds.com/juniors/en/ starting at approximately 4pm SA time daily. The latest news, results, photographs and video footage are also available on the website. South African remained in medal contention at the VISSLA ISA World Junior Surfing Championship when all six competitors in action yesterday the posted first or second place results to progress to the next round of their respective divisions at Oceanside in California. Adin Masencamp got the team off to great start by winning his U16 boys’ Round 2 matchup, delivering an assured performance that earned a heat tally of 14.0 points and relegated opening day standout Logan Bediamol (HAW) to second place as they both moved through to the last 32 in the division’s Main Event stream. Bell was back in the water on the South side of the Oceanside Pier just over two hours later but in similar fashion to her female teammates on Tuesday, she struggled to find the waves offering high scoring potential and placed third to drop into the Repercharge Rounds in the double elimination format. The rest of the day’s action consisted of Repercharge Rounds where the competitors who do not make the top two in their Main Event heats get a second chance to stay in the competition. Those finishing outside the top two in repercharge heats are eliminated from the event. Joshe Faulkner, SA’s only repercharge casualty on the opening day of competition, got his campaign back on track with a solid 12.94 heat winning tally to advance to U16 boys’ Repercharge Round 2 where he faces opponents from Chile, Ecuador and Panama later today. Teal Hogg secured a comfortable heat win in the U18 girls’ division, as did Chanelle Botha, with both girls progressing to Repercharge Round 2. And Richard Kidd finished a close second behind Esnaider Parrales from Ecuador to ensure that all 12 South African surfers are still in contention at the event. South Africa joins defending team champions Hawaii, hosts USA, France, Japan, Peru and Costa Rica as one of just seven out of the 36 national teams participating in the world’s biggest junior surfing event who have not had any members eliminated after three days of competition. Surfline, the official forecaster, predicts 3-4’+ (1.0 to 1.3 metre) wave faces for Thursday, with occasional larger sets on the best tides. The conditions will be semi clean in the morning with light onshore wind in the afternoon. See the schedule for Day 4 below with the South African team members who will be action and their heat numbers in brackets.